Children Jealousy, what to do? If you`re not an only child in a family, then you probably know thisfeeling, regardless of whether you are senior or junior. It`s quite difficult to share your mother with someone else. And when you also require love for a “rival” from a baby, sharing his toys, receiving ahalf of apple, instead of whole, then this becomes just a back-breaking task for many (and may be all) babies. It`s only correct adults` behavior that can save the situation. When we were expecting our second baby, we started searching models of parental behavior, which could help an elder child adapting to a new situation. After giving birth to a junior one, we had to adjust the whole theoretical baggage to our concrete situation. 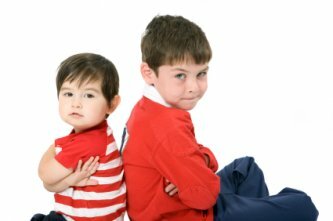 Before speaking about some methods, it`s worth admitting, that children jealousy can be expressed in quite different ways. Most popular and noticeable displays of it are – agression towards a junior and (or) parents. All this happens because we convince children that they must love a junior one and they have to hide their feelings from us. Besides, very often they just cannot express their feelings through words. Generally speaking, jealousy of the baby is strongest in the child under five years, because he is much more dependent on his parents and has fewer interests outside the family circle. The child of six or more is drawing away a little from his parents and building a position for himself among his friends and teachers. Being pushed out of the limelight at home doesn’t hurt so much .It would be a mistake, though, to think that jealousy doesn’t exist in the older child. He, too, needs consideration and visible reminders of love from parents, particularly in the beginning. The child who is unusually sensitive or who has not found his place in the outside world may need just as much protection as the average small child. Stepchildren whose relationships in the family might be shaky anyway may need extra help and reassurance. Even the adolescent girl, with her growing desire to be a woman, may be unconsciously envious of her mother’s new parenthood or pregnancy. 1. Spend enough time with the kids. Are you spending enough time at home? If not, then the children may feel deprived of your company, and will demand your attention whenever you are around, and if you inadvertently give more attention to one child, the other child is bound to feel the pinch. However, if you spend enough time with them, it wouldn’t really matter if you spend a little extra time with a particular child. They’ve each had their fill of you! If you are a working woman, then you may find that spending enough time with your children is not always possible. If this is the case, you could set certain rules, for example, you could make it a point to always put the children to sleep at night. In this manner, you at least spend an hour of quality time with them when you lie down with them, read to them, tell them stories and nurture them. 2. Don’t compare your children with each other. This is a guaranteed way to ignite fires of jealousy in your children’s hearts. Not only should you avoid comparisons between your children, but you should also avoid comparing your kids with other kids. 3. Don’t club your children together. Learn to recognize and appreciate the talents of your individual children. Don’t send them both for dance classes just because it’s more convenient. If one child shows a talent for dance, another child may show an affinity towards tennis. Let them choose the activities they want to get involved in to make sure there’s no bickering. 4. Listen to both sides of the story. If your children are squabbling with each other, don’t form your conclusions based on what they shout out at you. First, listen to one child, and then, listen to the other. This shows them that you value both their opinions. Be just and fair. Parents tend to indulge the younger child, and expect the older child to give in to her too. It is quite normal for one child to want to compete with the other. If there is a healthy sense of competition, it could work for the benefit of the child, as it pushes her to give her very best. But if taken to extremes, then jealousy can be an extremely unhealthy emotion, and can create various psychological problems that may carry on even later in life. Do your best to nip it in the bud. If you have more than one child than you have probably often worried about one getting jealous of the other. It can sometimes be very difficult to keep the peace between siblings. There is however some things that you can do in order to make sure that no jealous rifts form between your children. It can be especially difficult when you adopt a child, and you already have a few children of your own. If you are in the process of adopting a child this would definitely be a good time to discuss it with your other children, if you have not done so already. If they are too young to understand the situation then you should still tell them that they are going to have a new brother or sister. Just because you are adopting a child does not mean that you should treat the situation any different than you would if you were going to give birth to another baby. If you are not adopting a baby and are adopting an older child, you should still make it a special occasion. Not just for the child you are adopting but for your own children as well. Most children need some type of reassurance that they are still a very important part of the family. Of course you want your new child to adapt well to their new surroundings, but you also want to be sure and take the time to make sure all of the children adapt well to the sudden change in the family.